RLI NEA | Where people come to learn Rotary! Rotarians are business and community leaders working together to help make our world a better place to live, work and enjoy life. “Service Above Self”! At RLI, our purpose is twofold. First, RLI is a great place for newly inducted Rotarians to quickly learn about the “Object of Rotary”, “The Four Way Test” “The Five Avenues of Service” and much more. As in every endeavor, the more you know about something, the more interesting it becomes. Rotary is most assuredly one of those organizations that the more you put into it, the more you get out of it. RLI can make that possible for you. Graduates of RLI are more likely to remain in, and be a bigger part of Rotary, than any other demographic. Second, RLI seeks to have Rotary Clubs in its member districts identify those Rotarians who appear to have the potential for future club leadership (not necessarily as club presidents) and provide those so identified with a quality education in Rotary knowledge and leadership skills so important in voluntary organizations. RLI is a three part program, Part I, Part II and Part III. Each Part is a full day and you can take each Part as your schedule allows. It is an amazing learning experience for all Rotarians. Club Officers can build on their Rotary Knowledge to enhance their club experience. Club Presidents can expand on the skills gained at their President Elect Training Seminar. Long time Rotarians can re-kindle the old Rotary flame, and at the same time share their experiences with the other participants. What are the teaching methods? The Rotary Leadership Institute believes in course sessions with as much discussion/ participation as possible. Our Faculty does not lecture, they facilitate. Discussion breakout sessions are limited to approximately 10-15 persons. Course methods include discussion groups, role playing, problem solving workshops, creating projects and audiovisual presentations. Everyone participates during one of the Institute’s sessions. A course workbook containing an Institute Manual, session program agendas, faculty listings and course outlines and materials, is provided to each attendee. Who are the faculty? The faculty members are carefully selected by the Rotary Leadership Institute for their teaching abilities. They are drawn from all areas of the member districts and occasionally from outside the member districts. Many are present and past district governors, successful past presidents and those with experience in special areas. Each new faculty member must attend an initial full day training program and various periodic reorientation programs. The results of course evaluations help the Institute to improve the course content and instruction. What are the costs? The current course fees are per registrant per day. The fees cover breakfast, lunch, coffee breaks and considerable materials given to participants. Course fees also pay for meeting space, audio-visual equipment and promotional costs. The Institute strongly recommends that clubs pay the fees for their participants. 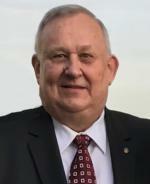 For current course fees please contact the appropriate Rotary Leadership Institute District Chair or visit our website. Should our club participate? If your club cares about its future, it will want the best club members and leaders possible. This is an outstanding opportunity for each club to improve the Rotary knowledge of its current and future leaders, who will also be exposed to new ideas of leadership. The exchange of ideas with other experienced Rotarians alone makes the courses worthwhile. What is the Graduate Program? After completing the three Part basic program, “graduates” are eligible to attend in-depth seminars held at selected locations in conjunction with regular courses. Each seminar runs for at least 2.5 hours in a morning and 2.5 hours in the afternoon session. Registration fees are modest. Seminar topics and registration forms may be obtained from the Rotary Leadership Institute Website. Who should be nominated to attend the institute courses? 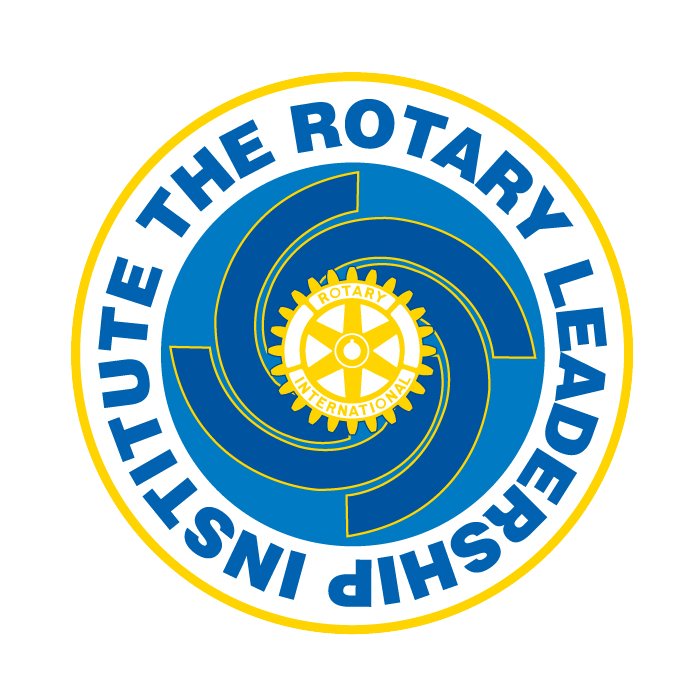 The Rotary Leadership Institute recommends that all new club members should attend RLI. Clubs should send those Rotarians who appear to have the potential for club leadership, not necessarily as future presidents. They should preferably be at least 3-4 years away from a possible presidency or other key leadership post. Candidates should certainly have a strong interest in Rotary and be ready to be exposed to the larger world of Rotary. When and where are the courses held? Courses are held at convenient locations within the Rotary Leadership Institute service areas. Any nominee may take a course in any location. Please contact the appropriate District Rotary Leadership Institute Chair for dates and locations. How to Register for RLI! Ready to register for an event? Look at the schedule on the left hand menu and click on "More Info". Then click on Read More below to see the step by step instructions. You can also click here for the pdf version of the instructions. If you have any issues registering, please register as a guest. Click on More info next to the session you are interested in attending. The following screen pops up. This will contain the information of the session you wish to register for. Double check the information to make sure you are registering for the correct session. Which link do you select? 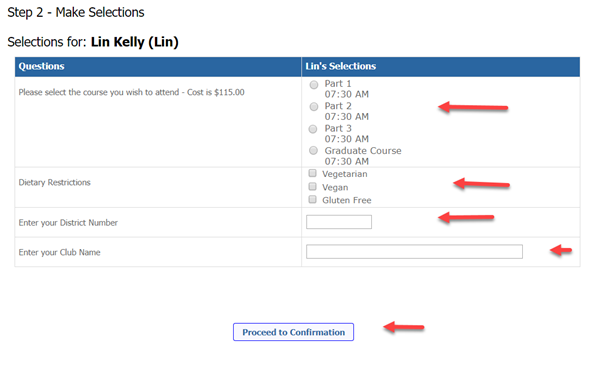 If this is your “first time” registering for an RLI NEA Session, click “RLI Guest Registration” to register. 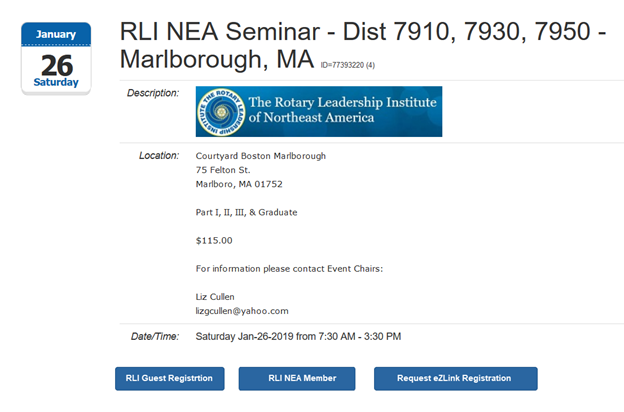 Although you may be a Rotary Club member, you need to register as a guest if this is your “first time” going to any RLI NEA Session. By registering as a guest, the Administrator will then convert your registration from Guest into your Club by adding you to the RLI NEA database. Next time you register for an RLI NEA session you can register as an RLI NEA Member. If you have taken a class use the RLI NEA Member button. This screen will appear. If you have forgotten your password, use Request eZLink Registration to receive an e-mail with a link to the Session Location for quick registration to the specific course and payment method. Does not recognize my log in? Won’t let me sign up for the course I wish to take, it says requisite not met? 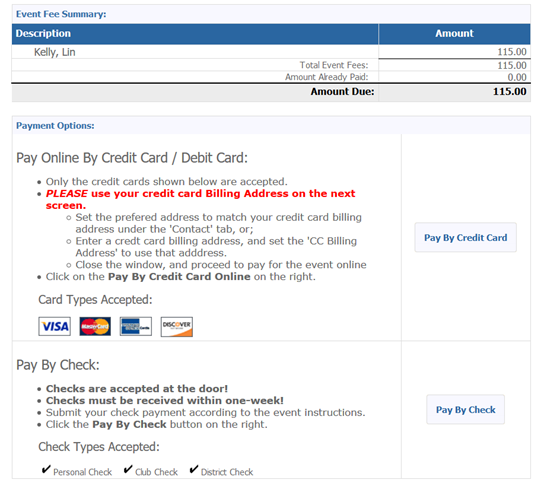 Credit Card payment won’t go through?